The provision was also criticised by Independent Councillor Mike Henderson, who called for a property purchase in Faversham. By providing properties the Council is saving on costs for this budget and that is why Opposition politicians find the pedestrian progress so frustrating. 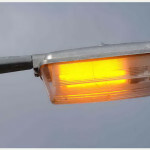 As of 21st September Kent County Council are conducting a consultation on the conversion of 118,000 street lights to Light Emitting Diode (LED). The consultation will ask people whether they would prefer the current level of service provided by part time lighting, or all night lighting. There has been considerable public concern since the previous lighting system was switched to part time lighting. It is not just a matter of crime but also the hazardous nature of travelling to work at early hours of the morning. Sittingbourne and Sheppey Labour do not want people to miss out on this new consultation on LED lighting. 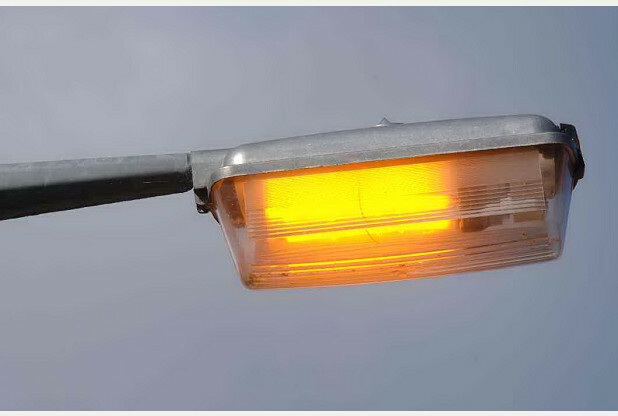 You can go to www.kent.gov.uk/streetlights and complete an online questionnaire. We have also been told that questionnaires will be available at public libraries. THE CONSULTATION WILL LAST 10 WEEKS. 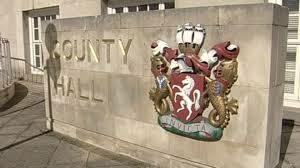 The Kent County Council has reported a £14.56 million overspend for the first quarter of the current financial year. This is the worst outcome for the 21 years that records have been kept and it suggests the Council will be extremely pressed to balance the books over the whole year. It is becoming clear that KCC, like many other large strategic authorities, is being compelled to set over optimistic budgets. The continual determination of the Tory Government to make local councils the biggest public sector victims of austerity is causing a crisis in the delivery of decent services. Some of the overspend is due to the immediate influx of additional migrant children. The official view is that these increased costs will be met by Central Government. They will not. Another area where a Government shortfall in support is hitting KCC is in the delivery of the concessionary bus fare scheme. Overall, and symptomatic of the whole problem, is that KCC, like many other authorities, simply cannot meet the growing demand for adult care services. This could be criticised as poor budgeting but it is a level of demand that is notoriously difficult to estimate. KCC is theoretically going through an experiment in transforming services and demand is meant to have fallen. Unfortunately, too, this doesn’t seem to be working. This is not all the fault of the Tories on KCC, but they need to be open and honest with the public, acknowledge the crisis, and make it clear that this really goes back to the Chancellor of Exchequer, George Osborne. The Labour Group on Kent County Council is calling on Kent County Council to give more active support to Thanet District Council in its attempts to secure a better future for the Manston Airport. Thanet District Council is pursuing the possibility of a Compulsory Purchase Order but without any open support from the County Council. 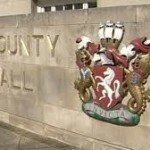 Labour has put down a motion to a meeting of the full Kent County Council, next Thursday, 17th July. The motion will be proposed by Group Leader, Gordon Cowan (Dover Town) and seconded by Deputy Leader, Roger Truelove (Swale Central). It has the support from Labour members across Kent. 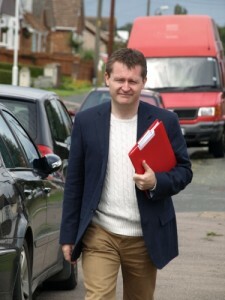 Labour Group Leader Mike Haywood. 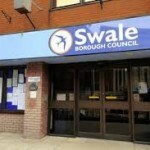 Cllr Haywood pledged that a Labour-led Council would pass on the Council Tax Support Scheme grant to Parish Councils, waive the 1% increase in councillor allowances, and buy three houses as temporary accommodation for the rising number of homeless families. One of the joys of becoming Leader of the Labour Group is that you get to rummage through the cupboard in the Labour Group office in Swale House. And unlike this year’s Conservative Budget, you won’t find any skeletons in it. One of the treasures I found was a copy of the Budget response from 30 years ago given by the then Leader of the Labour Group, Dr John Donnellan. When John Donnellan stood where I stand tonight, he drew attention to the way the Conservative Government had recently cut the Rate Support Grant from 69% to 51% during the previous four years. And he challenged the then Conservative Council to justify the level of reserves they kept sitting on. By the end of that decade, John Donnellan had become Labour Leader of this Council. It’s a salutary reminder to Members opposite that you are on notice. The Revenue Support Grant was always there to compensate local authorities with the greatest need. But the current Government have completely abandoned that principle. This coming year the Revenue Support Grant will account for as little as 26% and by 2016-17, just 10% of the Budget. We’ve reached a point where income from Business Rates, Council Tax, and even Fees & Charges are now more critical to balance our books. The localisation of Business Rates should be a spur to attracting new business. But failure to do so comes at a high price. If it wasn’t for the New Homes Bonus – which forms a key line in our balance sheet once again this year – we would be sunk. But the New Homes Bonus is like a mirage. It helps us to hold on by the white of our knuckles, but if our housing numbers drop off, we lose the money from it. Now, the Cabinet Member for Finance says that he is once again freezing council tax. But that’s not entirely true. Here’s the first skeleton in the cupboard. 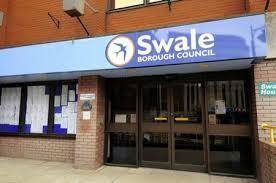 This Budget gives residents in many of our ‘parished’ areas an unfair council tax rise. In fact, some of them are seeing some of the biggest tax hikes in living memory because the Tory Leader refuses to pass on money from the Government under the Council Tax Support Scheme. This Budget is also unaffordable for the 1 in 10 people in our borough (the figure according to the Local Government Association) who have been hit by the Government’s welfare reforms and who are struggling to keep their heads above water. Whiting in a job but they don’t create a single job in our economy. These are the headlines behind this year’s Budget. Unfair tax rises in our parishes; tax bills for those who can’t afford it; and a list of initiatives going nowhere with millions sitting in the bank doing nothing. These are the reasons why we will not be supporting this Budget. And these are the reasons why we need a Labour-led Council once again.